The support for MyValkee for NPT1100 devices has ended. 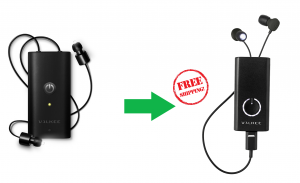 As a thank you for a loyal user, we offer to replace your old NPT1100 device with a HumanCharger® device for a low price! The HumanCharger® is user configurable on the fly with no need to plug it into a computer to change the settings. Talk about more convenient! The aluminum body is more durable and stylish, and earplugs have been redesigned to be more ergonomic. Please contact us at [email protected] with a serial number (S/N) of your old NPT1100 and we will get back to you with details how to proceed. Please dispose of your old device by taking it to a local recycling collection point for electronics.